Hiroshi Sugimoto is a Japanese photographer, born on February 23, 1948, in Tokyo, Japan. His interest in photography he showed at an early age. In high school he took his first photographs. It was of a film footage, in theater as it was played, in which stared Audrey Hepburn. In 1970 he enrolled studies of politics and sociology at Rikkyō University in Tokyo. At the Art Center College of Design, Pasadena, California, he retrained as an artist, in 1974, and received his BFA in Fine Arts. Later he settled in New York City, and soon after started working as a dealer of Japanese antiquities in Soho. Sugimoto has spoken of his work that it serves as a time capsule, and that it also focuses on transience of life, and the conflict between life and death. His work is affected by Dadaist and Surrealist movements, as well as the works and writings of Marcel Duchamp, who has deeply influenced him. He also showed a great deal of interest in modern architecture of the late 20th century. Sugimoto has a reputation as a photographer of the highest technical ability, because of his use of an 8×10 large-format camera and extremely long exposures. His work, he began in 1976, with series titled Dioramas. These show displays in natural history museums. Initial Dioramas were taken at the American Museum of Natural History, a place he returned for later dioramas in 1982, 1994, and 2012. Next followed Theater series, in 1978. He created these in old American movie palaces and drive-ins with a folding 4×5 camera and tripod. For the entire duration of the movie he was keeping the shutter open, exposing the film, while the projector was providing the sole lighting. In 1980, he began working on a Seascapes series, a series of photographs of sea and the horizon. He took these on locations all over the world, using an old-fashioned large-format camera, and made exposures of varying duration. These black-and-white photos, are the same in size, with the horizon line splitting them in the middle. Sanjūsangen-dō (Hall of Thirty-Three Bays), in Kyoto, was his project created in 1995, for which he had, in a special preparation for the shoot, all late-medieval and early-modern embellishments removed, as well as having all the modern fluorescent lighting turned off. It was shot from a high vantage point, with all architectural features edited out. The resulting 48 photographs, concentrate on the bodhisattvas, 1,000 life-size and almost identical gilded figures carved from wood in the 12th and 13th centuries, banked up inside the building. On a commission from the Museum of Contemporary Art in Chicago, in 1997, Sugimoto started creating his series of photographs of notable building all around the world. His later Architecture series (2000–2003) consists of blurred images of well-known examples of Modernist architecture. Next series, In Praise of Shadows, created in 1998, is based on Gerhard Richter’s paintings of burning candles. His series Portraits, was a commission by the Deutsche Guggenheim in 1999. In these he tried to use lighting that would have been used by a 16th century painter. He took a three-quarter view photos, using 8×10 inch negatives, and photographed wax figures of Henry VIII and his wives, which are taken against a black background. In 2001 he went to Japan to create photographs of a pine landscape. He visited so-called meisho “famous sites” for pines: Miho no Matsubara, Matsushima, Amanohashidate. On the royal palace grounds in Tokyo, Sugimoto photographed a pine landscape, copying a traditional 16th-century Japanese ink-painting style. In 2003, he went to St. Louis to photograph the Pulitzer Foundation for the Arts. Eventually, he ended up photographing Richard Serra’s sculpture Joe, which was in the courtyard. He took these photographs by setting the lens distance from the film to the half of the focal length, which he calls, “twice-infinity”. And with this he created a blurring effect. He mounted these hand-developed, gelatin-silver photographs, on aluminum panels, and left them unframed, unglazed and unlaminated to draw attention to what Sugimoto describes as the “transformation from the three-dimensional steel source sculpture to the thin layers of what I would call my ‘silver sculpture’.” In 2004, he created a large number of photographs of antique mathematical and mechanical models. These models were created in the 19th century, for learning and better understanding of mathematical functions, and mechanical properties of various devices. On this series Sugimoto began working, as a response to The Bride Stripped Bare by Her Bachelors, Even (The Large Glass) by Marcel Duchamp. In 2007 he created his Stylized Sculpture series. For these he selected distinctive garments by celebrated couturiers from the collection of the Kyoto Costume Institute, and shot them in chiaroscuro on headless mannequins. In 2009 he abandoned the use of camera, and decided to take pictures with a 400,000 volt Van de Graaff generator to apply an electrical charge directly onto the film. A 7×2.5 foot sheet of film is laid on the large metal tabletop, and the image is created by causing sparks to erupt on the surface. All Five Elements series, from 2011, consist of optical quality glass with black and white film. In 2012, he presented Couleurs de l’Ombre, 20 different colorful scarf designs in editions of just seven, created for French fashion label Hermès. Sugimoto established, in 2009, the Odawara Art Foundation to promote Japanese culture. His foundation was granted a $6 million, by the Japan Society, for construction of a multidisciplinary arts complex in Odawara. The project includes an original 15th-century entrance gate, a minimalist exhibition space, a modern Japanese teahouse, and a contemporary Noh theater with a stage that appears to float above the sea. Sugimoto is also an accomplished architect. After receiving requests to design structures from restaurants to art museums he began his architecture practice. Because he does not have an architectural license himself, he hired three young qualified architects to help him execute his vision. His recent projects include a Shinto shrine, a commission at Naoshima Contemporary Art Center in Japan, in 2013, a sculpture and rock garden for the Sasha Kanetanaka restaurant in Omotesandō, Tokyo, the Stove, a top-tier French restaurant housed in a refurbished wooden house in the Kiyoharu Art Village, Yamanashi Prefecture. And in 2014, a Sugimoto-designed glass teahouse was set over a tiled pool and had the traditional tea ceremony performed for the public in it, at the Le Stanze del Vetro museum, during the Venice Architecture Biennale. 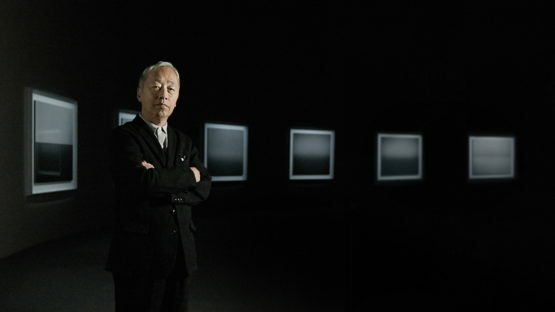 Sugimoto’s work is held in numerous public collections including the Metropolitan Museum of Art, New York, Moderna Museet, Stockholm, Centre Georges Pompidou, Paris, Museum of Contemporary Art, Tokyo, Museum of Modern Art, New York, National Gallery, London, National Museum of Modern Art, Tokyo, Smithsonian Institution, Washington, D.C., MACBA, Barcelona, and Tate Gallery, London. For his work he received a numerous awards. In 2001, Hasselblad Foundation International Award (Hasselblad Honour), 2009 from Japanese Art Association: Praemium Imperiale prize for the ‘Painting’ category, 2010 Medal with Purple Ribbon, and 2014, Isamu Noguchi Award for Kindred Spirits in Innovation, Global Consciousness and Japanese/American Exchange. Hiroshi Sugimoto is currently dividing his time between Tokyo, Japan and New York City, United States.